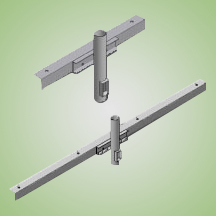 The TLCA Series of Angle Iron Cross Arms are designed for use with the Sport Lighter Series of fixtures. Cross arms are available to hold 2 to 5 fixtures each and may be ordered with a pre-drilled round straight or round tapered pole or crossarms may be purchased individually for wood pole mounting (wood poles provided by others). The heavy duty cross arm bracket is constructed of rolled steel that is formed into a 4” x 4” x 1/4” thick angle iron. Each crossarm is pre-drilled with 7/8” (0.88”) dia. mounting holes designed to accomodate the standard thru bolt mounting option on the Techlight Sport Lighter Series of fixtures or the cross arms may be ordered with a 2-3/8” OD tenon for slip fitter mounting.